In fact, there are a number of other nutrients that your brain needs to function properly. But there are two in particular that you probably aren't getting enough of, namely magnesium and folate. Research suggests that our diets are increasingly lows in these nutrients, and our brains are suffering for it! Read on to learn more. In your brain, magnesium acts as a buffer between neuron synapses, particularly the NMDA receptors that plays a role in many brain functions including memory and learning. Magnesium doesn’t activate the receptor, but protects it from over-activation by other neurochemicals, especially the neurotransmitter glutamate. When your magnesium levels are low, there isn’t enough to protect NMDA receptors, and glutamate constantly triggers the receptors, causing an excitatory response. In the long run, over-activation of NMDA receptors becomes toxic to your brain, leading to progressively worse damage and steady cognitive decline. Can you imagine being able to feel your memory improve in the time it takes to watch an episode of So You Think You Can Dance? Up your magnesium intake by eating lots of leafy greens like spinach, as well as black beans and almonds. Just make sure you only opt for raw or roasted, unsalted almonds. Peanuts are also a good source of magnesium. Alternatively, you can take a magnesium supplement. A readily absorbable form of magnesium such as magnesium citrate is better than a less absorbable form like magnesium oxide. It’s well established that folate, a water-soluble B vitamin, is a key nutrient for brain development in infants. This is why doctors strongly advise pregnant women to take a folate supplement – to fend off birth defects. 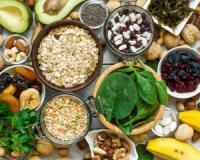 Now, research is suggesting that folate is critical to brains of all ages, and deficiencies are tied to cognitive decline, especially in the elderly. Studies have associated folate with improved memory function and mental processing speed – two factors that typically take a hit as you age. Some have even suggested that folate deficiency contributes to psychiatric disorders such as depression. Get more folate in your diet by munching on unsalted peanuts, which are folate powerhouses. They also pack a punch of heart-healthy monounsaturated fat. If you don’t like crunching nuts, try natural peanut butter instead. Other sources of folate include spinach, broccoli, asparagus, black eyed peas and egg yolks.